Iceworld. an intergalactic trading post, ruled by the power hungry Kane. Now his dream of total power is near to realisation with his acquisition of a band of mercenaires from the infamous Glitz in part payment for his debts. For ''Cryosleep'' will render the men utterly in his power. Meanwhile, Glitz stillowes the balance of the debt and looks to Iceworld's mythical dragon and the Dragonfire - the treasure it reputedly guards - solve his problems at last. 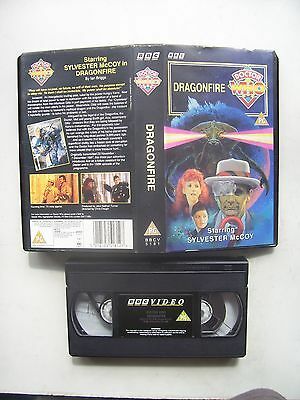 Intrgued by the legend of the Dragonfire, the Doctor, Mel and young Earth girl, Ace accompany Glitz - unaware that they are being followed by Kane's mercenaries. For the psychotic ruler believes that with the Dragonfire in his possession he can avenge the rulers of his home planet who bannished his long dead partner 3,000 years ago. And so it seems that beneath Iceworld's superficial civility lies a frozen core of corruption and the Doctor has embarked on something far more sinister than a mere treasure hunt.